I have to apologize right off the bat, I forgot to take my camera with me to school today, so I don't have any pictures from the morning. Sorry about that. Anyway, today we worked a little bit more on dinosaur names. I think some of the kids have them down much better than I do. Why in the world do they have to be so long? Today we made sun catchers. I had never done this project before, so I wasn't exactly sure what to expect. 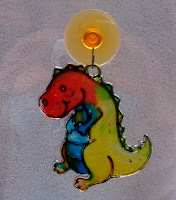 I, of course, got the sun catchers and the paint from Oriental Trading(dinosaur sun catchers, were out of stock, I linked to the sun catcher page). The project went extremely well. I had put the paint in cups so that it would be easier for the children to manage, each color got it's own paintbrush so we could "try" to keep the colors from getting mixed. I thought the project would not be able to go home until Friday because of drying time, but they were ready to go today. One word of caution if you ever use sun catcher paint--it starts to dry quickly. I had poured the paint in the cups, got the boys, had our intro, and there was already a skin on top of the paint by the time we started. They really did turn out cute though. I got to take a picture of my son and daughter's projects when we got home. Our other project they enjoyed today was dinosaur magic color scratch shapes. These are really neat and also from Oriental Trading. 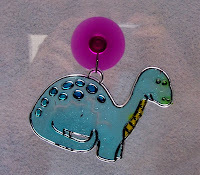 They are dinosaur shaped pieces of card stock-like paper, covered with a black coating that the children can scratch off and some bright colors shine through. I had this set out on one of the tables so the boys could do this if they were interested. The rest of the day ran pretty much the same. I must say I am very impressed with how well the boys are getting along and how well our days are going. One more day left--it's flying by. This is such a wonderful idea. I am going to pass this blog onto my school teacher friends. This project is just a beauty. I have always passed your tips to my niece.